a profound and marked state of constitutional disorder; general ill health and malnutrition. adj. adj cachec´tic. 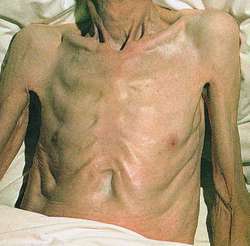 cachexia hypophysiopri´va symptoms resulting from total loss of pituitary function, including loss of sexual function, bradycardia, hypothermia, apathy, and coma. malarial cachexia the physical signs resulting from antecedent attacks of severe malaria, including anemia, sallow skin, yellow sclera, splenomegaly, hepatomegaly, and, in children, retardation of growth and puberty. A general weight loss and wasting occurring in the course of a chronic disease or emotional disturbance. 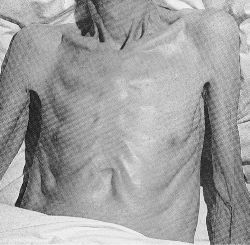 cachexia hypophysiopri´va the train of symptoms resulting from total deprivation of pituitary function, including loss of sexual function, bradycardia, hypothermia, and coma. general ill health and malnutrition, marked by weakness and emaciation, usually associated with severe disease, such as tuberculosis or cancer. Also called cachexy. cachectic, adj. A state of severe weight loss and tissue wasting seconday to underlying disease—e.g., AIDS, terminal cancer, congestive heart failure, COPD, multiple sclerosis, anorexia nervosa, malnutrition, congestive heart failure, tuberculosis, familial amyloid polyneuropathy, mercury poisoning and hormone deficiency. Weight loss, muscle atrophy, fatigue, weakness and anorexia. Cachexia is attributed to an interplay of TNF-alpha, interferon gamma and interleukin 6, and proteolysis-inducing factor, which is secreted by cancers. Corticosteroids, progesterone-like agents, selective adrenergic receptor modulators. Clinical medicine A state of severe weight lose and tissue wasting 2º to underlying disease–eg, AIDS, terminal CA, anorexia nervosa, or malnutrition. See Tumor necrosis factor. A state of severe muscle wasting and weakness occurring in the late stages of serious illnesses such as cancer. The usual condition of bodily decline in those dying after long debilitating illnesses. Cachexia is not due to malnutrition and research findings suggest that an important element in the causation may be selective depletion of the myosin heavy chain in myofibrillary proteins. A condition of general ill health, malnutrition, undesired weight loss, and physical weakness, often associated with cancer. n state of health with physical atrophy and weakness often found in the last stages of terminal illness. General weight loss and wasting in the course of a chronic disease or emotional disturbance. n the weakness, loss of weight, atrophy, and emaciation caused by severe or chronic disease such as with AIDS. a profound and marked state of constitutional disorder; general ill health and malnutrition. See also emaciation. severe wasting that occurs in association with chronic cardiac insufficiency. The result of anorexia, malabsorption and poor tissue perfusion with cellular anoxia. that due to diminution or absence of pituitary function. Manifested by progressive loss of body weight associated with muscle atrophy due to lack of protein anabolism in the absence of growth hormone. According to Market Intel Reports published on January 31, 2016, the US market for cachexia is estimated to be over USD1 bn. Interestingly, the inflammatory profile associated with cachexia reduced the hepatic drug clearance in cancer patients via depressing the expression of cytochrome P450 (CYP) in liver, namely, CYP3A [33, 34]. The murine CT26 tumor model for inducing cachexia in mice was established as previously described (Aulino et al. Historically, treatment has focused on the underlying illnesses that predispose patients to cachexia, and it is only very recently that cachexia has been regarded as a treatable syndrome in its own right. Decrease of serum carnitine levels in patients with or without gastrointestinal cancer cachexia. They are motivated by the fact that no cachexia therapeutic currently exists. Even though medicine has no definitive cachexia treatment, health-care professionals can acknowledge patient and family concerns. Clinicopathologic findings in budgerigars that died with cachexia, hepatomegaly, and-or splenomegaly during a 26-day period after introduction of a new group of budgerigars to the flock. The fatigue and weakness of cachexia have been attributed to skeletal muscle wasting. Date Clinical symptoms 1 2004 Dec Pneumonia 2 2005 Mar Pneumonia 3 2005 Mar Pneumonia 4 2005 Mar Pneumonia 5 2005 May Cachexia, alopecia 6 2005 Aug Cachexia, pneumonia 7 2005 Aug Diarrhea, pneumonia 8 2005 Sep Pneumonia, predation 9 2005 Sep Predation 10 2005 Oct Cachexia 11 2005 Oct Trauma 12 2005 Oct Cachexia, alopecia 13 2005 Dec Cachexia, diarrhea 14 2006 Feb Cachexia, alopecia 15 2006 Feb Cachexia, alopecia 16 2006 Apr Cachexia, alopecia 17 2006 Apr Cachexia 18 2006 Apr Cachexia, alopecia 19 2006 May Cachexia, alopecia, pneumonia 20 2006 Jun Cachexia, alopecia, pneumonia 21 2006 Aug Cachexia, alopecia, pneumonia 22 2006 Aug Cachexia, alopecia, pneumonia 23 2007 Dec Cachexia, pneumonia Chamois ELISA result RT-PCR result no.